O God, strength of those who hope in you, graciously hear our pleas, and, since without you mortal frailty can do nothing, grant us always the help of your grace, that in following your commands we may please you by our resolve and our deeds. Through our Lord Jesus Christ, your Son, who lives and reigns with you in the unity of the Holy Spirit, one God, for ever and ever. The virtues of gratitude, confidence and love, stimulated and motivated by the Holy Eucharist, are especially necessary in the modern world. Today gratitude has become a forgotten virtue; confidence in God has been replaced by arrogant self-reliance; love for God and for mankind has been driven from the hearts of many by a spirit of pagan selfishness. Catholics must strive to revive these virtues and shall have the special help of Our Lord in the Holy Eucharist. If we cultivate a deep and persevering devotion to Him who dwells among us under the humble appearances of bread and wine, particularly if we receive Holy Communion frequently and fervently, we cannot but make progress in the spirit of gratitude, in unwavering confidence in God's assistance, and in ardent love both for God and for our fellowmen. According to the 1962 Missal of St. John XXIII the Extraordinary Form of the Roman Rite, today is the feast of St. Ephrem. His feast in the Ordinary Form of the Roman Rite is celebrated on June 9. It is also the feast of the martyrs, Sts. 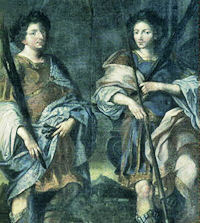 Mark and Marcellianus. Excerpted from Little Pictorial Lives of the Saints, a compilation based on Butler’s Lives of the Saints, and other sources by John Gilmary Shea (Benziger Brothers: New York, 1894).